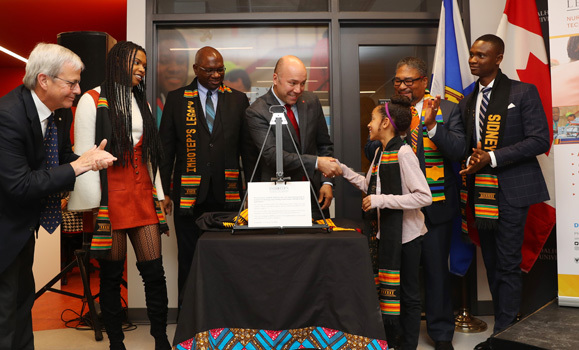 That’s how Oxford Junior High Grade Eight student Eve Wedderburn described Imhotep’s Legacy Academy’s new learning centre and “makerspace” on Dal’s downtown Sexton campus at a grand opening event Wednesday. 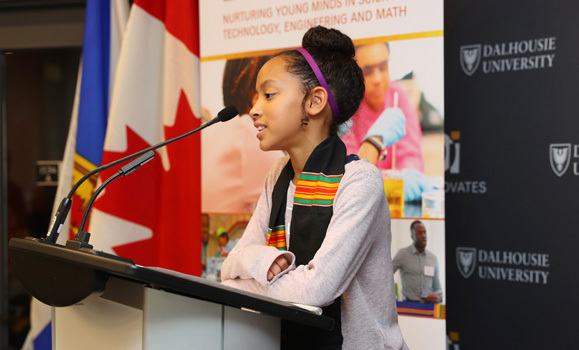 Eve is one of more than 700 elementary, junior high and high school students across Nova Scotia served each year by Imhotep's Legacy Academy (ILA), a Dal-based organization that helps steer more youth of African heritage into science, technology, engineering and mathematics (STEM) fields through engaging activities and meaningful mentorship. As an aspiring dentist, Eve (pictured below) said ILA has been a fun way to learn about science and a great way for her to stay a step ahead in math and sciences and realize what is possible for her in the future. ILA’s new home on Sexton Campus provides the group with more physical space (they were previously located in the Killam Memorial Library), more flexibility over scheduling, and will enable even bigger, better, more engaging programs. 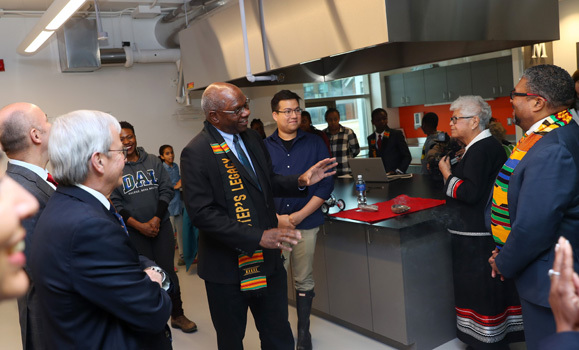 Now in its 16th year, ILA will be using the new spaces to shift the way it operates slightly to increasingly bring participants into the university environment to be mentored, said Pemberton Cyrus, president of Imhotep’s Legacy Academy and Dal’s (acting) associate vice-president academic. "Every aspect of this space is designed to inspire," he said, remarking on the lights, wave motifs and images of students on the windows. "As you go around here and also in the makerspace, you'll see there's a lot of STEM symbolism." Dr. Cyrus (shown above centre), also a professor in the Faculty of Engineering, said the increase in the number of students of African heritage in STEM programs at Dal and other post-secondary institutions in Nova Scotia in recent years can be tied partly to ILA’s work. He noted that his home faculty alone has at least six current students who came through the program. 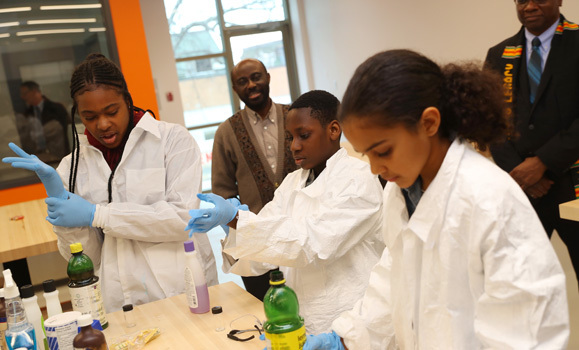 While ILA previously relied on borrowed space in schools, libraries, and labs, it can now book activities at times that are more convenient to students and provide more resources for learning. The new 725-square foot makerspace features a designated 3D printing room, soldering stations, wet lab, and collaboration workstations. 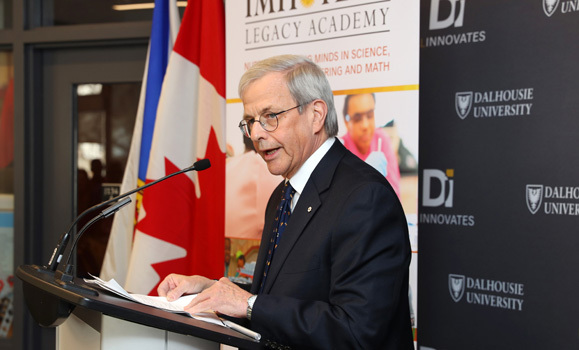 Calling ILA’s track record “inspirational,” Dal’s interim president and vice-chancellor Peter MacKinnon said the group’s work supports the university’s larger strategic priorities around equity, diversity and inclusiveness (EDI). 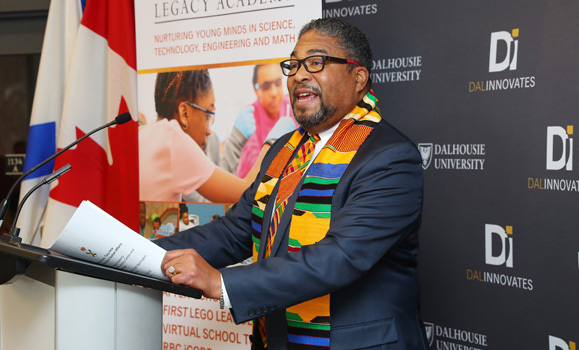 “The representation of traditionally marginalized students in STEM studies and careers is critical to the EDI initiatives at Dalhousie,” said MacKinnon (pictured below). He said ILA’s success is an example of what can be achieved when universities, communities and other partners work together in pursuit of shared goals. “Partnership is not a buzz word; it’s an essential feature of successful initiatives,” he said, noting that ILA also provides other benefits such as employment for current student mentors and a path for more students to come to Dal. Funding for the new spaces came largely from the federal government’s Post-Secondary Institutions Strategic Investment Fund (SIF) through Dal’s $64-million IDEA Project, which was mostly completed last fall and added two new buildings and other upgrades to Sexton Campus. Andy Fillmore, member of parliament for Halifax and parliamentary secretary for Canadian Heritage and Multiculturalism, applauded Dal, ILA’s co-founders, staff, mentors and other partners for their passion and hard work. “You’ve helped a generation of African Nova Scotians become leaders in STEM fields. And standing here today, I have a feeling that we’re only just beginning to see the positive impact of ILA on these extraordinary individuals and on our community overall,” he said. 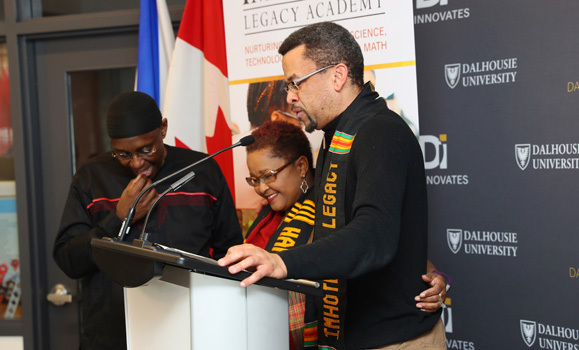 ILA’s more than a decade of achievement owes much to its three co-founders: Kevin Hewitt, Barb Hamilton-Hinch and Wayn Hamilton (who also provided a libation ceremony with words and the pouring of water in honour of descendants of Africans). The trio ended the event by speaking a bit about their early vision for the organization and its growth over the years. Dr. Hamilton-Hinch, an assistant professor in the School of Health and Human Performance, said she has seen more diversity in Dal’s medical school, in the health professions, in science programs and in faculty and staff as a result of ILA and other initiatives at Dal. She also spoke about the importance of young people seeing others who look like they do in the institution and the inspiration those mentors can provide. Attendees at the launch event, emceed by ILA executive director Sidney Idemudia, also heard from first-year Science student Jasmine Desmond, an ILA graduate and recipient of an ILA-TD Opportunity Scholarship. Desmond said ILA taught her how interesting science can be and that it was something she wanted to learn more about. Dr. Hewitt described ILA’s tri-mentoring system as the “main ingredient” of ILA’s success, referencing the Dal professors of African descent who mentor the university students who then mentor the students in schools across Nova Scotia. He said taking that idea and turning it into reality required respectful relationships and a lot of hard work and dedication from the co-founders and others. Left to right: Plaque unveiling with Peter MacKinnon, Jasmine Desmond, Pemberton Cyrus, Andy Fillmore, Eve Wedderburn, Tony Ince, and Sidney Idemudia.